Café Rouge was one of those restaurants I would pass, thinking that it wasn't really me. I would see middle-aged women seated outside of my local having a smoke, a drink and perhaps a bit to eat, and I subconsciously wrote off CR as somewhere I had no need to go. Luckily, at the end of last year plans were made, and I ended up entering one of the red restaurants that constitutes one of the very many CR restaurants in London for a lovely, simple, fresh breakfast. So, last week I did not turn down the suggestion to go for a full three course evening meal. You can't miss a CR, usually, at least, the window frames and doors are painted a letterbox red. Inside, It has an iconic, classic pub appearance. I know that's weird as pubs are traditionally English, but that is what comes to mind first. You have the dark polished wood furniture, red furnishings, and an eclectic mix of old-fashioned glass lamps on the walls. French phrases lavish the walls and the mirrors, quotes painted in the cafe's trademark colour with gold. Transported back in time, you can imagine perhaps how it was to pop to a French café in the 50's with smoke lingering in the air and well-dressed women sipping on their coffees and chocalat chauds. The menu is of course traditionally French with the name of each dish in the language, giving it that authentic touch and slightly more high-end feel for a restaurant chain. I went for a garlic mushrooms on french bread starter. The bread was light and crisp, the mushrooms, sliced and cooked in a light sauce were instantly garlicy but not in a lingering way. My main of fishcake, fries and salad scores a 6 1/2 out of 10. It wasn't something I'd usually go for. 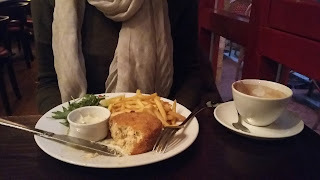 The fishcake wasn't the most flavoursome but I was glad the salmon didn't over power it. It wasn't heavy or greasy at all and had a good ratio of crumbs to fish. I was surprised by how big the cake was, but it was melt-in-the-mouth and so, easily manageable; as with all courses the sizes were perfectly calculated; maybe not big enough for the average man though. The fries were crisp but not too hard as they can sometimes be when thin. 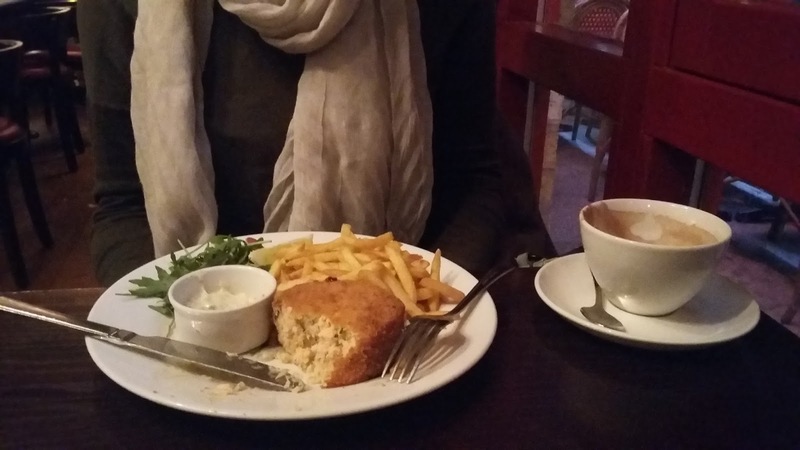 The tartare sauce was a traditional well-seasoned accompaniment to the meal. But I appreciated the salad of mixed leaves and radish. So simple but refreshing and along with a squeeze of lemon provided a little sharpness and refinement. Usually preferring hot deserts, I decided to finish off with something different to my norm. 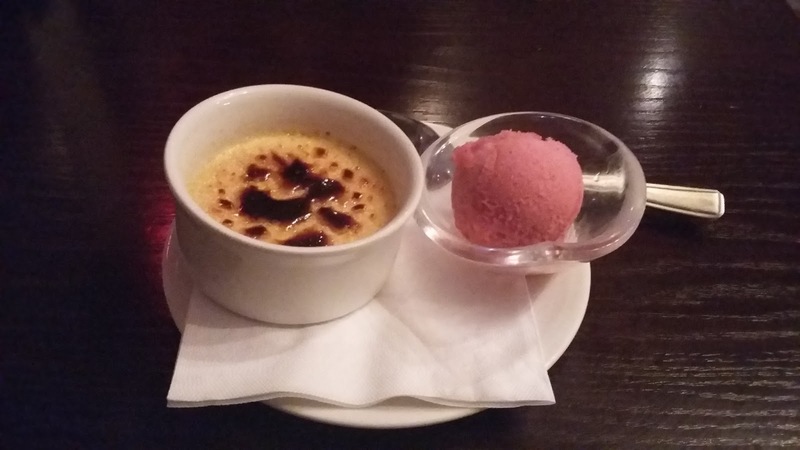 I went for the Crème Brulée, a simple dessert of custard with caramelised sugar on top, and a strawberry and black pepper sorbet. I wasn't sure how well the two were going to gel, and to be honest, they weren't complimentary but, for me, two seperate deserts. The waiters were pleasant and prompt and added to what was overall a surprisingly pleasing experience.